In Toni Cade Bambara'a 1980 novel The Salt Eaters, the healer Minnie Ransom asks Velma Henry, "Are you sure, sweetheart, that you want to be well?" This is a question that we might want to ask America in 2008. The sickness of war surrounds us. One would hope that poets can be healers like Minnie Ransom. We know the power of the word. Many of us have been touched by the word. It's language that holds us together. It's an honor to be invited to read at Split This Rock Poetry Festival; to read at this historical moment. I gave my very first poetry reading back in 1969, just down the street at All Soul's Church. I read with poets Ebon and Carolyn Rogers. The musician Marion Brown was there. Brown had once played with John Coltrane. We were all witnesses back then; artists giving testimony to a new consciousness. Today poets gather at Split This Rock to voice opposition to war. To proclaim the wellness that flows from peace. We lift our voices to sing. And to quote Prince - "This is what it sounds like when doves cry." Carolyn Forché reads on Saturday night at the festival. 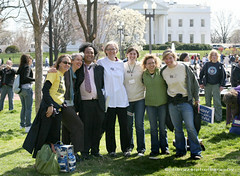 Part of the gang after the final day of Split This Rock 2008. 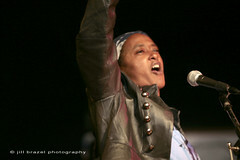 Check out more photos on Flickr at http://www.flickr.com/photos/splitthisrock/ - we're adding more every day.